Every schoolkid in North Carolina gets to go to Old Salem at least once in their lives. It's a living history village in historic Winston-Salem, NC. For most of the kids it's really just a day out of school, but it was actually kinda cool, seeing how people lived back in the 18th century. They have all these neat displays and do all these neat demonstrations - from ye olde candle-making and gunsmithing, to ye olde cooking in the fireplace and baking. They have the ye olde best cookies, too. Thin wafers, of varying flavors. Once you start eating them, you can't stop. Seriously. Lemon, Gingersnap, Sugar, mmmmmmm. 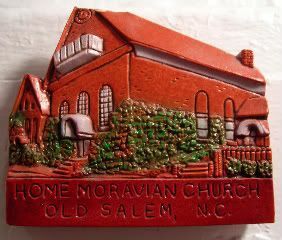 I have to say that I've eaten a million ye olde Moravian cookies, and I've watched a few ye olde Moravian demonstrations, but I gotta say, that I hadn't any idea that ye olde folks that founded it - the Moravians - were actually missionaries from Pennsylvania. And, that the Moravian faith originated in (what's now) the Czech Republic! That's kinda neat. Ye Olde Salem has changed and improved over the years. It used to be this tiny little place where you'd just go and hang out for the day. Nowadays, they've managed to make it a whole Moravian experience - there's a whole fancy visitors center, shops, bakeries, and two new museums I've never been to - the Museum of Early Southern Decorative Arts and the Toy Museum (that one I need to visit soon). Plus their snazzy site, to make sure you don't miss a thing. No matter how many times I go, though - my best, most fondest memory of Old Salem, was our class trip in like 6th grade or so, where we stopped off for lunch at the McDonald's at the Old 85 Lexington exit (which is still there, as of last Christmas - how's that for longevity). It was a very exciting lunch. I got to sit with my crush at the time. I was totally over the moon, and if I could draw little hearts over my "I"s right now, I supertotally would. Plus, I'd totally write "joy loves _____" all over this post. Hahaha. Yes, I still remember his name. No, I'm not sharing. And maybe I'm about to go Facebook stalk him right now. Yes, I totally stole David Tennant's Ye Olde joke from his video diaries. I couldn't resist. Boo. He's not on Facebook. Sigh. I never got to go to Old Salem. [/sv] Though I heart their bread too. Remember that? With the sugar and the cinnamon? Yum. Also? Yes, I just sat on your blog. Heh. What a cute magnet!! Love it. And now I want gingersnaps. I think 82% of my cravings come from reading your posts. My dentist thanks you for the business. Ok. So every schoolkid besides Jen got to go - wasn't that you that we went to Old Salem? Or, did we decide the pricing was too steep to actually go for the amount of time we had? I forgot about their bread. And, thanks, GG - I was going to mention that the top steeple broke off, so this is what the Home Moravian Church really looks like. oooh... what comment did you delete? did someone out your 6th grade crush??? and how come jen never went to old salem? seriously?? is this like her saying she's never been to biltmore before we took her?